Remembrance Nature Park commemorates the signing of the armistice on 11 November 1918. Within the park there is a plaque to Aboriginal people who served in the armed forces. It also marks the end of the Remembrance Driveway which runs from Sydney to Canberra. An echidna, disturbed from its feast of ants, scuttled into the grass and began digging for sanctuary. A kangaroo leaped into the scrub. We could have been in some remote wilderness, but there was the faint hum of traffic in the air and the view was of the nearby dome of the Australian War Memorial, Parliament House, and the white office towers of Civic. Beyond, the blue hills of the Brindabella Range cut the sky. Honor Thwaites, walking stick in hand, led us at a cracking pace up a grassy slope, pointing at a patch of bluebells here, a carpet of golden "billy-buttons" there. Small birds twittered in the trees lining a dry creek bed. "The creek flows strongly after rain," said Mrs Thwaites. "It's simply Mount Ainsiie wringing itself out." Mrs Thwaites and a small army of friends she has gathered together have spent the past 11 years working to save 14.5ha of what must one of Canberra's best-kept secrets. The land, on the lower slopes of Mount Ainsiie, directly behind the War Memorial, will be officially declared the Remembrance Nature Park at a ceremony at noon on Friday. Mrs Thwaites, who lives at the foot of the park in Cobby St, Camp bell, set out on her campaign in 1977 when she learned of a National Capital Development Commission plan to allow two-storey town houses to be built along the fringe of the land. On November 11, 1978 — 60 years after the World War I Armistice was signed — the then Minister for Territories, Bob Ellicott, gazetted the area as a park. The Friends and other supporters began to tend the land to regenerate its natural beauty. They picked up rubbish, removed weeds and cleared growth that was not native to the land. Greening Australia provided young trees and students from near by Campbell High School helped plant them. The Society for Growing Australian Plants provided advice and assistance, the War Memorial staff became enthusiastic, and there was further help from rangers and others in the ACT Parks and Conservation Service. The Australian Bicentennial Au thority gave a grant so that the park, to be opened during the bicentenary, would be part of Australia's 200th birthday. Scenic walking tracks were mown — mowing was required only once because the enthusiasts spent so much time trekking around their dream-place, the tracks were soon well stamped. There was a magical day when an Aboriginal friend from the Northern Territory performed a brolga dance among the rocks of a natural amphi theatre in the park, creating haunting sounds with a didgeridoo. Not far away, a little plaque has been placed on a rock for walkers to find. It reads, "Remembering the Aboriginal people who served in the Armed Forces". Wooden park benches have been built at strategic viewing points, but little has been done to disturb the natural tranquility. 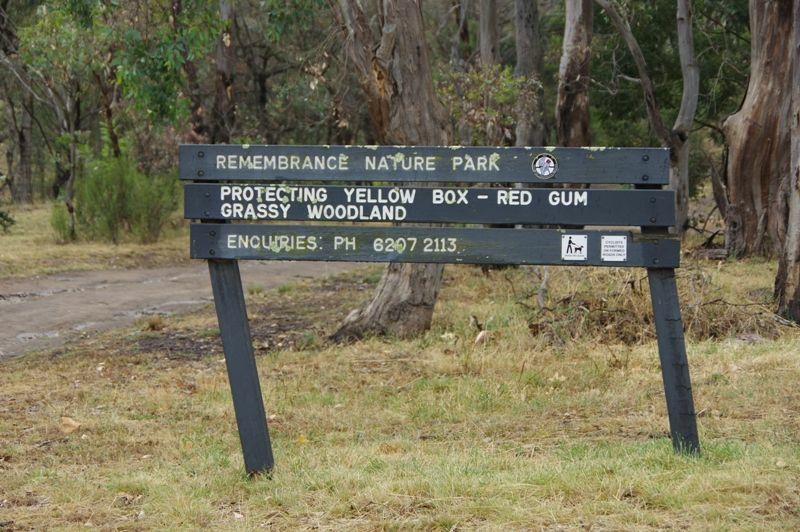 Ten years ago, when the park was gazetted, Mrs Thwaites had erected a wooden sign declaring "Preserve and enjoy this park for it symbolises the peace and freedom precious to all Australians and for which many have given their lives". On Friday, 10 years to the day after that gazettal and 70 years after the Armistice, the Remembrance Nature Park — the dream of one determined woman — will finally be a reality. There is clearly power in dreams. The Canberra Times (ACT), 7 November 1988.